With Thanksgiving just a couple days away, I thought it was the perfect time to share a new dessert recipe that would be *amazing* for your holiday dinner table. 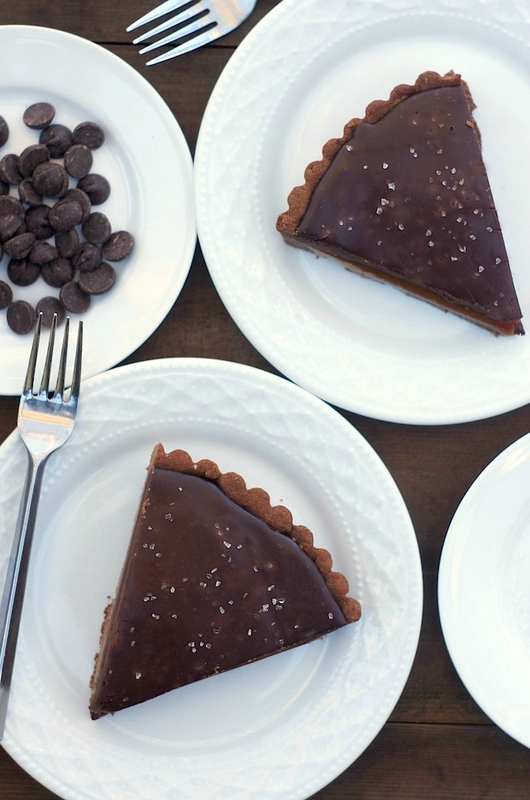 A Chocolate + Caramel Tart, topped with sea salt. Swoon! I bookmarked this recipe a while ago, but was waiting for the right occasion to make such a decadent, over-the-top dessert. Conveniently, a fab group of food bloggers and I had our monthly supper club last weekend, and the menu was cozy comfort food – homemade pierogies with all the fixins. 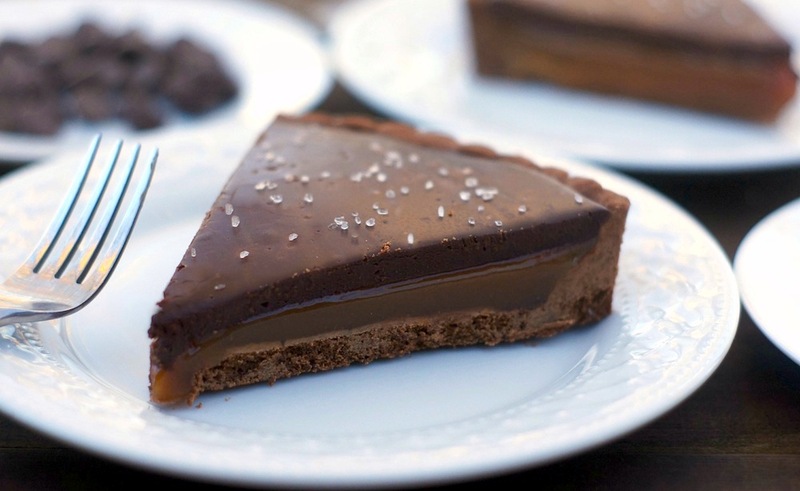 The combination of chocolate + caramel is wonderfully comforting to me, so I knew that the supper club would be the perfect occasion to make + share this tart for dessert. And y’all, the results? Holy moly, this is one fabulous dessert. It starts with a flaky, buttery, chocolate crust. Then, it’s topped with an ooey, gooey sweet homemade caramel layer. Then, a layer of super-rich chocolate ganache, sprinkled with wonderfully-addictive sea salt. Everything combined is scrumptious – rich, delicious, + indulgent. While it’s pretty simple, skill-wise, to make, it does takes a bit of time, as some of the layers need a few hours to set before you can proceed to the next layer. So, start it a day ahead so you have ample time to complete it. I hope lots of you try this for your upcoming holiday dinners — I know you + your families will love it! 2. Make the caramel: In a 1-qt. saucepan, whisk together sugar, corn syrup, salt, and 6 tbsp. water and bring to a boil. Cook, without stirring, until a candy thermometer inserted into the syrup reads 340°. Remove pan from heat and whisk in butter, cream, and crème fraîche (be careful – the mixture will bubble up) until smooth. Pour caramel into cooled tart shell and let cool slightly; refrigerate until firm, 4–5 hours. Goodness! I’m speechless over this one. This sounds like something I would absolutely love! This was so so very good. Thanks for bringing it along! Can you believe I’ve not yet made my own caramel? Recreating this tart is the perfect excuse for me to tackle that next kitchen skill. Be still my heart! This is absolutely gorgeous. I need to make this ASAP! Sorry if this is a stupid question…but does “dutch-process” mean? Can I use the standard run of the mill unsweetened cocoa powder? Oh my! Every thanksgiving table deserves one chocolaty dessert and this recipe is it. Oh my goodness, what a beautiful looking dessert! I love the flavor combinations here, the cocoa, caramel and chocolate ganache sound heavenly and so decadent. Perfect for impressing all your guests. Pinning, thanks for sharing Amy and hope you and your family have a wonderful Thanksgiving! Thank you so much, Kelly! Hope you and your lovely family have a fab Thanksgiving, too! Oh, this tart! It combines pretty much my two favourite flavours and it looks absolutely beautiful. No wonder it was such a big hit! This tart looks perfectly decadent! So pretty! That slab of caramel in the middle is totally making my mouth water. YUM! This is one of your prettiest pictures. I pinned it, chocolate and caramel are my faves. Happy Thanksgiving. It sure looks fabulous!! Loving the salt too, omg yum! This is STUNNING. I love seeing that layer of caramel…makes me want a slice right now. And the salt on top is the perfect touch. Thank you for sharing! Ok, this is going to be my cheat meal for this week. I can’t resist! This is one serious dessert. I’m talking jaw-dropping, contest-winning, hang-up-the-apron-and-retire dessert. There’s never enough chocolate at the Thanksgiving table, so I think this dessert is a must this year. Thanks Amy!! This is gorgeously decadent! Thanks for sharing. Do you have any advice about how to get such a lovely, clean cut on the slices? This looks absolutely amazing! What sweet decadence! The sea salt on top definitely puts it over the top! i want a big slice of this. What a beautifully elegant dessert! Happy Thanksgiving to you and yours! Looks delish Amy and Happy Turkey Day. Eat, Drink, and Live Well!! I just fell in love with this tart, it looks absolutely perfect! I would surely take more than one slice.. yum! What a gorgeous tart, Amy! I definitely would love to have this on my holiday table. So rich and luscious! Thanks for the recipe. Have a great week! My chocolate loving heart is going wild over this beauty!!! meant to comment on this last week and tell you what a fantastic sounding recipe! plan to make sometime soon! I may just have to make this for Christmas… it looks awesome! Ok, this caught my eye on Pinterest. Just beautiful! I will be making this for Christmas! I am so looking forward to it!! Really a piece of delicious tart, become hungry now and love to eat. Thanks for sharing with us. Keep sharing. Amy – how far in advance did you do each step? 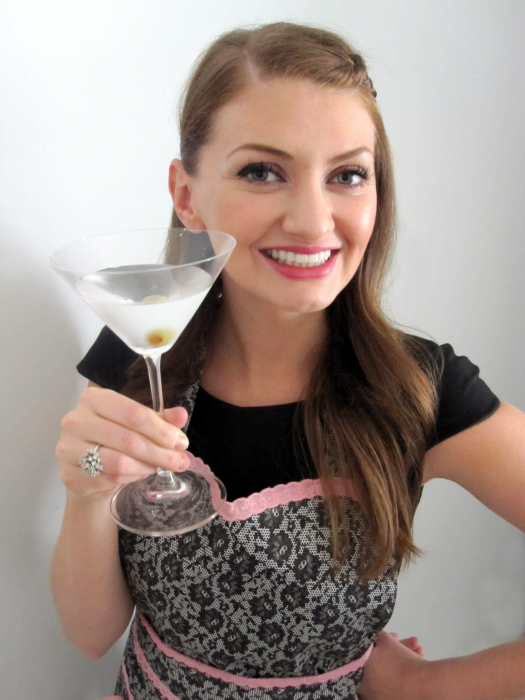 I want to make it for NYE. Can I do it a whole day in advance? Or will it get too hard and cold in the fridge? Hi Nick, I did the crust and the caramel the day before the party, the ganache on the morning of the party, and that gave everything plenty of time to set. Just remember, you need about an hour for the crust to cool before proceeding, 4-5 hours for the caramel to set before proceeding, and 4-5 hours for the ganache topping to set. So yes, you can definitely do it a whole day in advance – it won’t get too hard and cold in the fridge. Just pull it out of the fridge at least 30 minutes before serving so it can warm up a bit. And don’t sprinkle the sea salt on to the top until the very end – it dissolves slowly, so it looks best when it’s been freshly sprinkled on. Enjoy! And report back how it goes! Tried it, and the caramel totally didn’t thicken at all, no matter how long I waited. Followed the ingredients and instructions exactly. Had to add a bunch of corn starch to it, which completely ruined the whole thing. Definitely won’t be making again. I guess the ‘fearless’ part of the title comes from willingly eating stuff like this. Epic, disappointing fail. If you were a company, I’d demand a refund. What if you dont have a candy thermometer? Is it essential? Jocelyn, good question. You don’t need a candy thermometer if you trust yourself to just “eye” the caramel and be able to identify when it’s done. You should cook the caramel until it’s dark amber-colored and smells toasty, but not burnt. At that point, remove it from the heat and stir in the butter, cream, and creme fraiche as the recipe describes. Many people who don’t trust that their candy thermometer is calibrated correctly actually prefer to use the color/smell to judge when the caramel is ready, rather than use a thermometer/temperature. So yes, you can do it without a thermometer!